Yes, it’s unbelievable, but my little man is in an iPad 2 commercial. People have been asking me how this happened and the short version of the story is that a casting lady saw him eating shave ice with grandma and grandpa at Waiola Shave Ice and thought he’d be great. In the end, he was who they wanted. The funniest reaction so far has been from my father-in-law, who blurted out, “But he looks so Japanese!” and then kept staring from the commercial to him and back, not believing it was actually him. 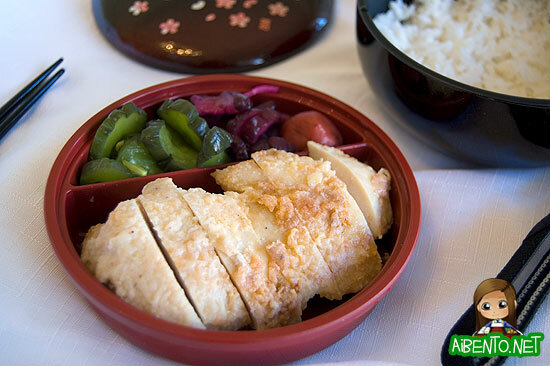 I made this bento last week, using a J-List box I hadn’t unpacked in quite some time. Sadly, it’s now out of stock or I’d have given you guys the link to buy it. The chicken is sprinkled with this paprika mixture I bought at a local craft fair, but I don’t think I put enough of it on, as it looks a little pale. In the bottom bowl tier is rice and then next to the chicken I put eggplant and cucumber pickles and a nice big ume. Since this was leftover chicken, I just sliced it up and arranged it all and packed this in less than 10 minutes!